Fifteen years after a planned retirement, alumna Sylvia Villarreal is helping patients as a pediatrician and owner of a small-town clinic in New Mexico. 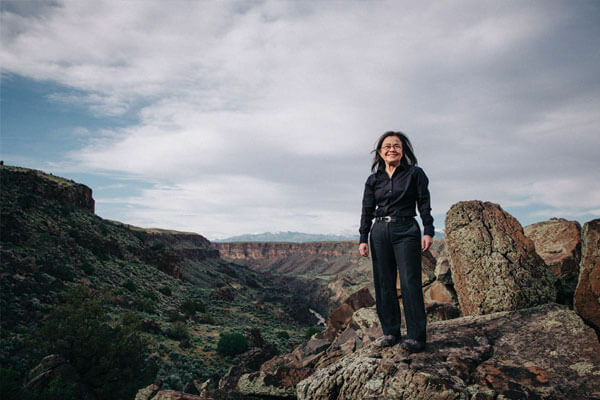 Every year, thousands of children come from miles around rural Taos, New Mexico, to see Sylvia Villarreal, M.D., (B.A. ’72). And each one of those young lives is special to the woman commonly known as Dr. V.
As a physician, Villarreal’s greatest joy is providing care to chronically ill children and seeing their smiling faces, which is the case most days. But every so often, death claims a life that wasn’t fully lived. “I’m given the privilege of taking care of children, some who are near end of life and make it to only 7 or 8 years old,” she said. On those days, the good doctor hurts. Advising a child’s family “when to keep pushing for treatment and when to let go,” and finding the right words when, for example, a premature baby dies, never gets easier. However, Villarreal, the CEO and owner of the Taos Clinic for Children and Youth — the only patient-centered medical home of its kind in north central New Mexico — doesn’t plan to stop anytime soon. “Medicine is a service,” she said. But medicine was also her calling. Born as a 10th-generation San Antonian, Villarreal grew up in California, Hawaii and Canal Zone, Panama, as a military dependent. Her primary education was shaped by Samoans and Irish nuns. Her grandmother Simona, a folk healer who used herbal remedies, was one of her earliest influences. Her other grandma, who was blind, also affected her approach to medicine. “She taught me to see with my hands,” Villarreal said. Villarreal fit right in and flourished, even amid social unrest nationwide. “It was a time of great chaos and upheaval across the United States, with anti-war sentiments and the Chicano Movement spreading in the city,” she said. Among few Latinas studying biology at St. Mary’s, which formally became co-ed in 1963, she didn’t face discrimination. After St. Mary’s, she was accepted into medical school at Stanford University, and later completed her internship, residency and chief residency at the University of Colorado in Denver. Now, at age 65 with nearly four decades of practicing pediatrics and teaching it at the university level under her belt, she stands up for child patients as their advocate on a local, state and national level. At her clinic, Villarreal and her four-person team see about 20 children per day, ranging in age from birth to 18 years old. 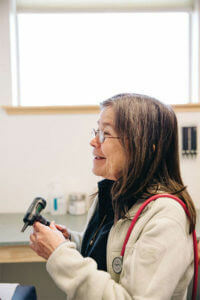 They serve 27,000 patients — more than five times the population of Taos. The children Villarreal treats for primary care have various chronic conditions: asthma, heart disease, blindness, mental health issues, and rare genetic and neurological disorders, to name a few. “About 30 percent are special needs, and 80 percent are on Medicaid, meaning most of these kids come from poor families,” she said. Daily duties include ordering medicine that local pharmacies don’t carry, or acquiring customized wheelchairs and orthotics, which can become routine challenges. The region surrounding Taos is devoid of things found in big cities — like stores and people. The summers and winters can be equally harsh. However, she appreciates the town where “nothing is convenient” and its hardworking, agriculturally-rooted residents. She originally moved to Taos from San Francisco in 1999 to retire, but after settling in, bought her friend’s clinic a year later and has since been the sole owner. In and around Taos everyone knows each other, Villarreal said, so she really learns about her patients and their families. For bioethical reasons, she also gets to know their religious and spiritual backgrounds. About 55 percent of her patients are Hispanic and primarily Roman Catholic; an additional 15 percent are Native American and from the Kewa Pueblo, a group that maintains an indigenous religious belief system. Each family’s needs in terms of treatment require sensitivity and compassion. Villarreal credits St. Mary’s, especially her philosophy classes taught by Marianist brothers, for equipping her with the theological critical thinking she applies working with families experiencing medical emergencies. Working with children keeps her feeling young, Villarreal said, but there are days when she needs to escape and recharge. Typically, she heads outdoors to fly fish, hike nearby mountains, or tend to her garden. When she needs a big city fix, she’ll travel — then return to Taos. Villarreal’s retirement was stymied long ago, but she’s OK with that. The governor of New Mexico personally asked her to stay after she thought about closing shop in 2005. Bill Richardson had received too many letters asking for his help keeping her in Taos, and he wanted it to stop. She obliged. “If I’m healthy and able, and feel I still have something to offer, why shouldn’t I work?” she said. After all, medicine is her destiny.